Many of you will know and love Dan Green for the many characters he has bring to life through his voice acting career across many different mediums – most notably voicing Knuckles the Echidna in recent years. Unfortunately, Dan’s wife has passed away after giving birth to their twins last week. We here at the Sonic Stadium would like to extend our utmost sympathies at this time to Dan and his family in this tragic loss. We call upon you, Sonic fans, to visit the Dan Green Guestbook. Here, you can donate to help Dan take care of his daughter and son. Even if you cannot spare anything monetary, spare a thought, leave Dan a message on the page, and show him the love and support he has from his many fans. 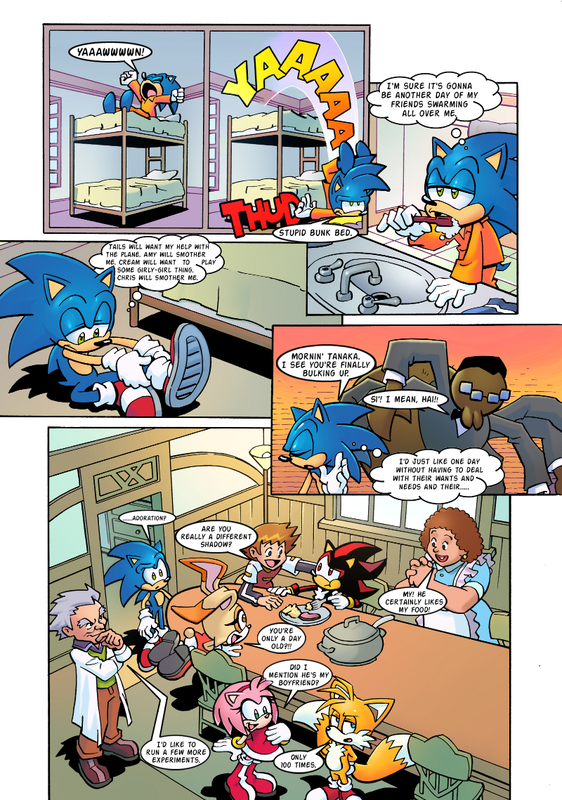 This week’s page is an example of Sonic Egg’s use of continuity for future gags and jokes. In a previous page, Tails mentioned something about giving the Tornado “sentience”. This wasn’t a throw away gag. He’s really doing it. And you can see him at work below. Also, did I….neglect to mention that no one on this comic particularly cares for Chris? This comic runs weekly at ECC. You can discuss this comic with long time fans and the creator’s at their forums, where occasional sneak peaks of future pages are given. A lot of you probably have already seen the first season of “Sonic X” many times and own the DVDs, but hey, why not watch it again on your computer? Today, Hulu has uploaded the entire first season! Currently, the episodes are only in Japanese with English subtitles that you can switch on and off with Hulu’s closed-captioning feature. Hulu will be working with 4KIDS to obtain the English-dubbed episodes. In addition, if you’re outside the United States, you will be locked out from watching them. Watch Season 1 of Sonic X on Hulu now! 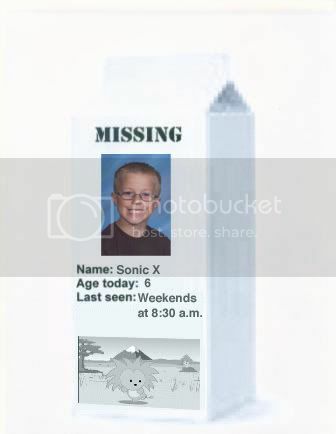 A 6 year old Norwegian child by the name of Christer had his hopes crushed recently by the King of Norway who he wrote to asking for his name to be changed to ‘Sonic X’. The child, a fan of the Japanese Anime of the same name, wrote a letter to King Harold V but his parents thought common sense would prevail and were at first reluctant to post it. Several months passed until Christer finally begged them to send it and amazingly once they did they received a reply. King Harold V wrote back stating that he couldn’t change the child’s name yet as he was under the age of 18 but that if he asked again some 12 years later he would happily change it then. 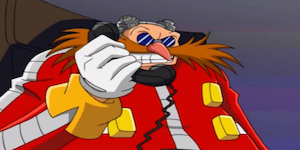 Alls well that ends well though as Sega have actually tried to make contact with Christer through the website in question to send him some Sonic X Goodies to cheer him up. New Sonic Plushies? In Europe? With Our Reputation? It’s true. Eagle-eyed SSMB’er Sonic-Fan has spotted some new Sonic X branded plushies, which will be heading for Europe in ‘Early 2009’. The drawback? You can’t buy them. You can only win them. The plushies were found on SEGA Prize Europe’s website, which is a subsidiary of SEGA that deals in prize arcade machines – the most common of which being UFO Catchers. While super-rare, SEGA branded UFO Catchers do exist in the UK, with the two most prominent ones located in London’s Trocadero Plaza (the building formerly known as SEGA World) in Piccadilly. Although these plushies will most likely feature in SEGA’s own UFO Catchers, the ‘Trade Purchase’ option suggests that non-SEGA branded machines could also house these awesome looking toys. You can grab one of five different characters; Sonic, Tails, Knuckles, Amy or Shadow. No Eggman sadly, but these 12″-15″ plushies look very cool indeed and are much better than some of the other official UFO plushies that looked like cheap knockoffs. The Sonic one is particularly cute. D’aw, look’attim. He wants a hug. If you’re a prominent arcade manager, or a rather brave Sonic fan that will gladly pass themselves off as an arcade manager, then you can buy these plushies in bulk cartons of 6 pieces. You can enquire via the SEGA Prize Europe website. So I randomly thought of Sonic X, which made me randomly remember digital tv channel Jetix, which I randomly remembered show Sonic X, which made me randomly remember they have a Sonic X website, where I randomly remembered they use to have a Sonic X store on their site, so I went there and clicked the ‘Store’ link. I was randomly taken to a page full of Sonic X items at a site called Toystore.co.uk. Americans have it pretty good with Sonic comic and cartoon media right now. DVD boxsets of SatAM, AoStH and… erm… Underground, and plenty of new Archies to wet the dream of many a comic connoisseur. 4Kids want to get in on the action and start airing Sonic X again! Remember that one? The one with the 4Kids. Yes, the adventures of Sonic, Chris, Tails, Chris, Cream and Chris will start appearing on 4Kids TV every Saturday starting this weekend, at 10am (ET/PT, because we know that bit’s important to you). 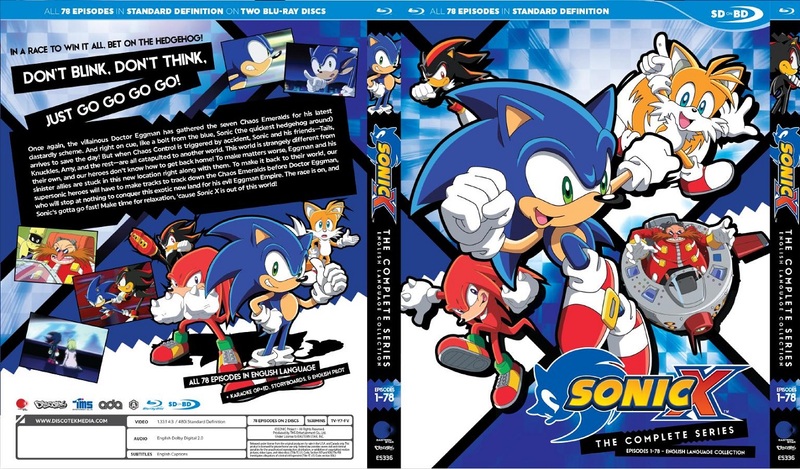 Sonic X can also be watched on demand via an array of digital channels including Comcast. Not only that, but there’ll be a new DVD release, including the Chaos and Shadow Sagas (eps 27-38) coming 2nd September 2008. Now Americans have it very good, surely! 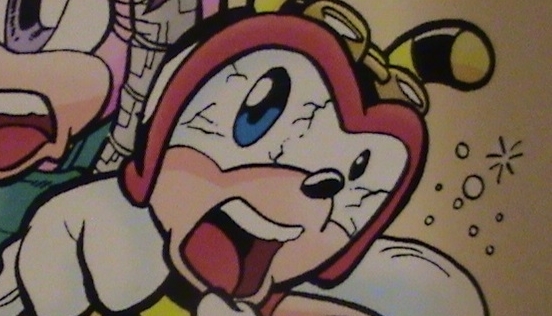 Penpen2nd of the Bumbleking Forums recently received an e-mail from the anime DVD seller/publisher Right Stuf that the Sonic X DVDs have been “marked for close out”, and will be discontinued as soon as it’s sold out. I was recently able to confirm this with their customer support. This means that these DVDs may soon start disappearing from store shelves for good. If you want them, you’d best pick them up now. As far as I know, this only applies to North America, or wherever Funimation distributes the DVDs. Sonic X will be airing in reruns as part of 4KidTV’s Saturday morning line up this fall. 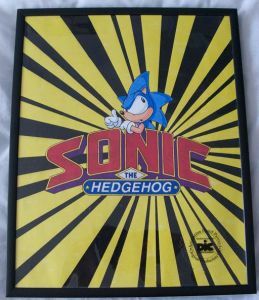 When it comes to Sonic merchandise, things have been pretty tough down under, that was, until the recent release of Sonic X on DVD, which it seems has paved the way for more Sonic merchandise such us the soon to be on sale Sonic X figures. Moose Toys, a company that deals primarily with craft and somewhat abstract toys have picked up the rights to redistribute the figures which are currently on sale already in the US and UK. Slated for simply a June release, the toys should be available soon from all major toy retailers with no RRP specified yet. With the amount of money spent on video games, and being home to two of the biggest gaming developers in the world, you’d be forgiven for thinking the UK was actually a third-world country when it comes to the industry. Particularly for Sonic merchandise, where material on the blue blur besides games have all but dried up in comparison to other countries. Sonic X, the popular japanese Sonic anime, will be airing new episodes on Jetix from the beginning of September 2005. This news has been officially confirmed by Jetix themselves. Thank you for your e-mail about the programme Sonic X.
I can confirm that new episodes are scheduled for the beginning of September 2005, however, exact dates have still to be confirmed. Thank you for contacting Sky. This e-mail appears authentic and is probably not a hoax. It confirms that Sonic X will be appearing on Jetix come early September. Jetix is a channel only available to cable or sattelite TV viewers, and can be found on Sky channel 609. As soon as a more specific date emerges, it will be posted here. Want Sonic X screenshots from the latest Sonic X episodes? Look no further, as TeamArtail’s Artie has been adding the latest episodes in screenshot format, head to TeamArtail’s Sonic X section for the latest screenshots. He usually updates every week, and you can also find older episode screenshots. 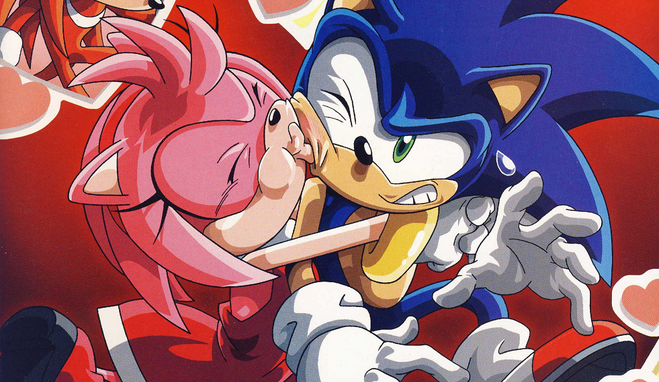 Sonic X – Woo, it’s not the end after all. Sort of. Well, as most people in the UK know, CiTV were showing Sonic X on Wednesdays. Cool, but a bit of a bugger after Fox Kids decided to show it 4:30pm every day a week or so ago. Episode 13 has passed and gone, and it seems both Fox Kids and CiTV don’t want to go past it, as Fox Kids are already showing repeats. CiTV will be showing reruns of Sonic X starting Monday at 3:40pm every day, AND it won’t be the 5-minute cut version. It will be the 25 minute long, as-long-as-the-US-version… version. Who knows if FK and CiTV plan on showing more? I reckon CiTV are playing a set of reruns to attract people who missed out the first time, or just want to see the extra ‘uncut’ version, then continuing the series. Which would be a good idea. Below is from Animation Insider. Fans of the FOX BOX do not have to wait until September 1 to see the television block’s new programming offerings. Instead, the network will air special “sneak previews” of their three new series throughout August. Sonic X, Funky Cops and Shaman King will all having special airings during the month before their official debut on September 1. In this premiere episode, Sonic and Eggman fight over the possession of the seventh Chaos Emerald, the legendary stone that is said to give its possessor the power to rule over the entire world. With the support of his friends, Tails, Amy, Cream and Cheese, Sonic storms into Dr. Eggman’s base. Meanwhile, all seven Chaos Emeralds are brought together, causing a large-scale Chaos Control warp in space, blowing away Sonic and his friends, who land in a world of humanoids setting the stage for a series of exhilarating and elaborate adventures.